To safeguard their future, mining companies must improve performance, cut production costs, reduce environmental impact, and increase automation. Mining companies face major challenges in terms of sustainable growth. As demand for commodities exceeds supply, mining companies search for new deposits in remote and inhospitable regions where production costs are high. In addition, they seek to improve safety and reduce environmental impact. Energy-intensive processes in harsh conditions and remote areas demand robust, safe and energy-efficient process equipment. Energy costs represent 25 to 30% of a mining company’s operating costs. 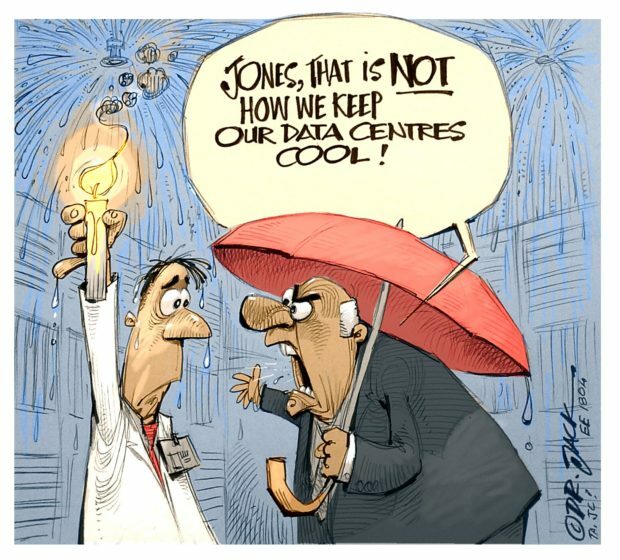 This is especially true in remote areas where energy costs are a major contributor to companies’ operating costs. Much of the energy is used by electric motors. 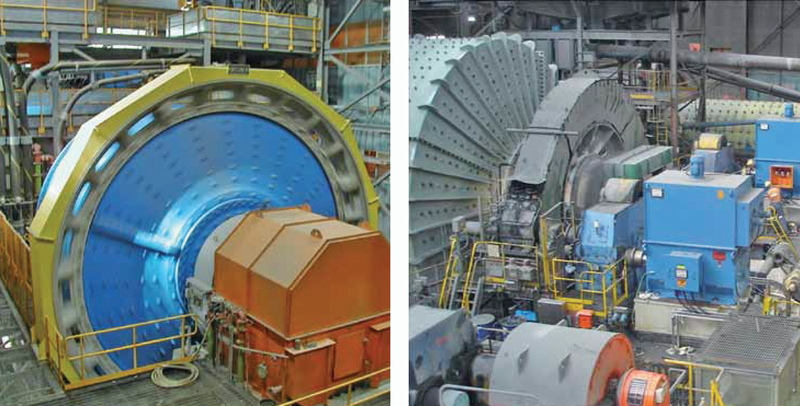 In many mines, motors run at fixed speed regardless of actual output requirement, wasting a tremendous amount of energy. Energy use can be cut by up to 60% by controlling motors with electric variable speed drives (VSDs). Equipment in most mining processes is exposed to extreme working conditions such as dust, precipitation, high temperature variations, high altitude and weak network conditions. Such conditions place high demand on process equipment which has to ensure high production output. Fig. 1: Typical fan characteristic showing operating point. 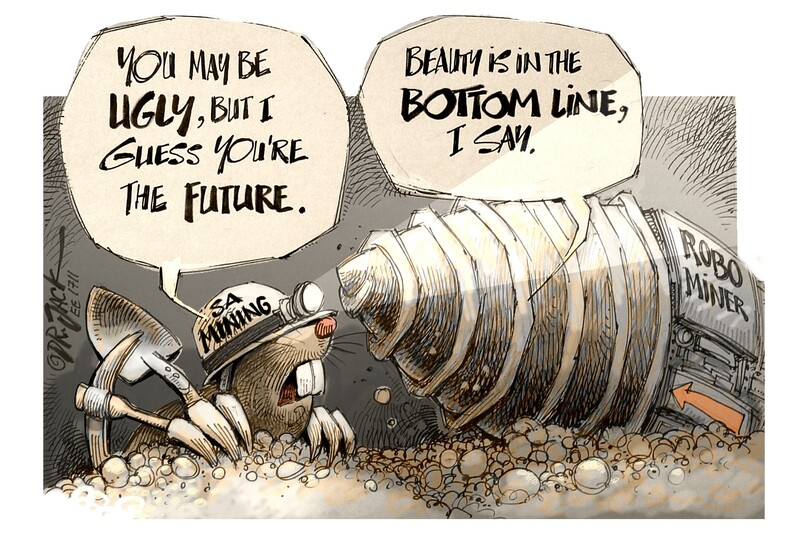 Safety is paramount in the mining industry. Equipment must provide high levels of personnel safety as mines can be hazardous working environments. Precautions must ensure that the equipment does not present a hazard. VSDs provide optimised process control and save energy. Controlling processes with variable speed drives has a direct impact on companies’ operating costs. Today, VSDs are used in a wide range of applications in the mining industry. 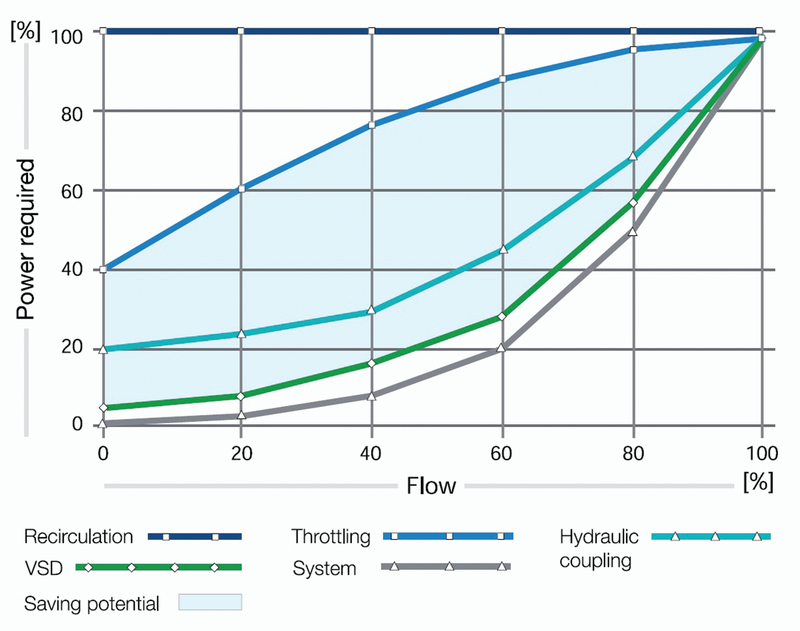 The most common flow control method is by means of a fixed-speed motor where flow is adjusted by a mechanical device. This method can be compared with adjusting the speed of a car by braking while keeping the foot on the accelerator. This technique does not only waste a tremendous amount of energy but also wears out the equipment. With electric variable speed drives, changing the flow is simply achieved by adjusting the speed and/or torque of the motor. This can be compared to reducing speed by taking the foot off the gas pedal. The equipment is operated at the “best efficiency point” (BEP) under all operating conditions. Electric VSDs are the most efficient control method, saving energy, decreasing CO2 emissions and minimising total operating costs. 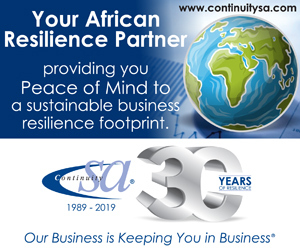 Variable speed drives replace mechanical control devices such as valves, fan inlet vanes, hydraulic couplings and dampers which are often used in various mining processes. Variable speed drives can reduce the energy consumption of most motor-driven applications. Fans, for example, typically run at partial load. Huge energy savings can be achieved by controlling their speed with VSDs. The power required to run a fan is roughly proportional to the cube of the speed, i.e. a small reduction in speed can make a big reduction in energy consumption. A fan running at half speed uses less than 15% of the energy compared to one running at full speed. 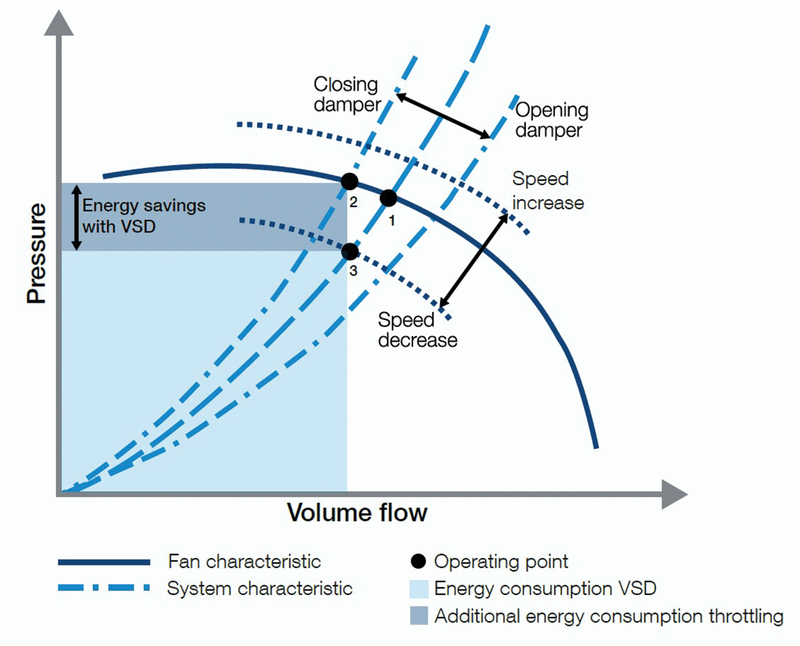 The energy bill can be reduced by as much as 60% by employing VSDs on fans instead of dampers and vanes. Consequently, electric variable speed drives also help to reduce CO2 emissions. VSDs also act as soft starters, reducing the stress on the network, motors and process equipment. During the starting process, the VSD increases the motor speed progressively and accelerates the load smoothly to its required speed. Soft starting eliminates high starting currents and voltage dips on the supply network, which can cause process trips. By soft starting, maintenance costs will be reduced and the lifetime of the equipment extended. Full starting torque VSDs provide full starting torque even under weak network conditions. The torque can be controlled precisely throughout the entire speed range and harmful torque peaks are eliminated. Due to the power loss ride through function, ABB drive systems can withstand disturbances on the power supply. The drive will continue to operate in an active but non-torque producing mode if the incoming supply voltage is cut off. The drive is active as long as the motor rotates and generates energy to the drive. It will resume normal operation immediately upon return of power supply. Flow is proportional to speed. Pressure is proportional to the square of the speed. Power is proportional to the cube of the speed. Fig. 1 shows a typical fan characteristic, which is a function of volume flow and pressure. Also shown is a typical system characteristic. The operating point of the application is at the intersection of these two curves. If the required volume of air deviates from this point, the fan and/or system characteristic must be changed. Traditionally, the most common way of changing the operating point is by means of a damper which alters the system characteristic (operating point moves from position 1 to 2, see Fig. 1) increasing the system losses. However, increasing or decreasing the fan speed with a VSD will change the fan characteristic itself (point of operation moves from position 1 to 3, see Fig. 1) without adding additional losses. The energy consumption can be reduced significantly because lower pressure is needed for the same air flow. Fig. 2: Power consumption for various pump control methods. Energy consumption is the most critical factor of a pump’s total life-cycle costs. About 20% of a mine’s total energy consumption is used by pumps. The flow and pressure of pumps must be controlled due to fluctuations in process demand and system parameters. The flow and pressure can be adjusted electrically with VSDs, or mechanically, with fixed-speed solutions such as throttling valves, hydraulic couplings or recirculation. As the affinity laws also apply to centrifugal pumps, controlling the pump motor speed with a VSD brings substantial energy savings compared to on/off control, throttling or any other control method. The pumps will be operated at the BEP under all operating conditions, saving energy, decreasing CO2 emissions and minimising total operating costs. Soft starting, another benefit offered by VSDs, eliminates pressure peaks in pipelines. Pumping slurry is one of the most demanding applications for a pump. Parts wear out quickly due to high-density, abrasive and corrosive substances, and maintenance and energy costs are high. The operating speed of a centrifugal slurry pump is one of the most important factors determining the lifespan of the pump. Operating them at full speed increases impeller wear and reduces the pump’s lifetime. With a VSD, the pump speed can be adjusted to match fluctuations in system parameters such as flow rate, static head and settling velocity. Should a pipe start to block due to changes in concentration or particle size, the VSD can adjust the pump speed so that the flow is above the critical velocity, preventing blockages and avoiding a shut-down of the plant. With VSDs, slurry pumps are operated at the most efficient rate, reducing energy and maintenance costs considerably. By controlling mills with VSDs, the system can easily react to changes in ore characteristics and throughput. There is no need to change mechanical components if ore characteristics change. Also, the speed of the mill can be tuned for optimal grinding and maximum throughput, resulting in more efficient use of the grinding power. If upstream and downstream processes require lower grinding throughput, the mill can be operated at partial load without having to stop the process. VSDs can adjust the speed according to the fill level of the mill. With dual pinion mills, care must be taken that the load is shared equally between the two pinions. 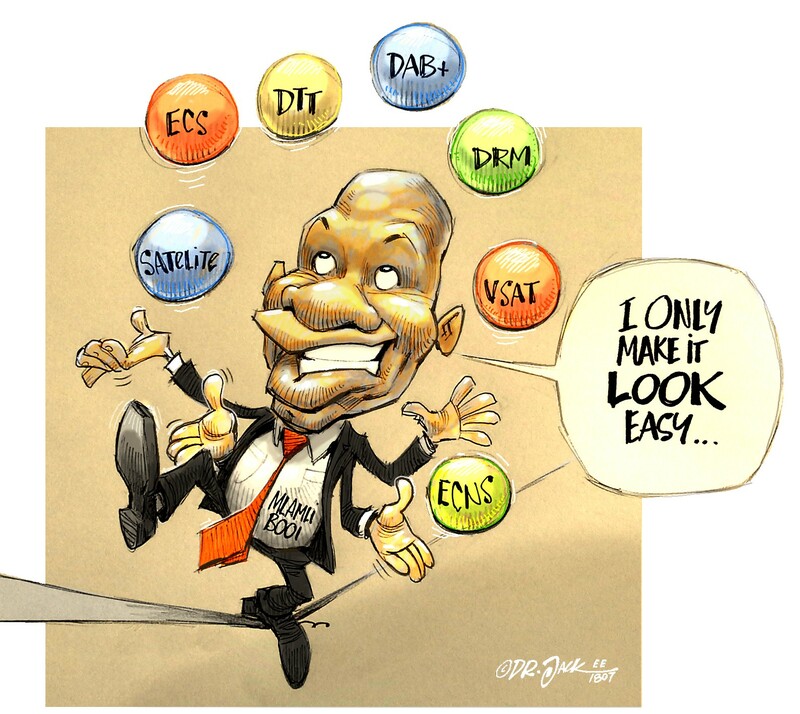 VSDs ensure accurate and coordinated load sharing. Torque pulsations and peak torques generated by mill equipment during the starting phase create high stresses on network and mechanical equipment. VSDs provide a smooth ramp-up of the mill. They deliver high starting torque for the current drawn from the power system and have a programmed upper limit to reduce peak torque during the start of the mill. The low starting currents and high starting torque enable a smooth start-up for the mill, even when fully loaded. Mills are one of the biggest energy users in mines. Controlling them with VSDs results in significant energy savings. Conveyors are used in various mining processes. The environment is demanding and there is always the risk of damaging the belt by overstretching, slipping or breaking. It is important to extend belt lifetime and availability to reduce operational costs. VSDs provide accurate torque and speed control for conveyors. This reduces the stress on mechanical equipment such as gearboxes, pulleys and belts, especially during start-up and stopping, but also during operation and maintenance. With VSDs, it is possible to control the speed of the conveyor to match the production capacity and, as such, reduce wear and save energy. The conveyor can be run at low speed for maintenance inspection, belt changes, repairs or avoidance of ice build-up. Accurate and fast load sharing ABB medium-voltage drives provide accurate and fast load sharing between several drives. This is useful for conveyor applications where two or more motors operate on the same conveyor belt, ensuring that all motors are loaded as needed. The converter control provides a window speed limitation to prevent belt slippage. With ABB medium-voltage drives, the power factor is greater than 0,95. There is no need for additional power factor compensation and there are fewer losses on the electrical network. Also, the electrical network is not exposed to high inrush currents when the conveyor is started. Downhill conveyors require continuous braking to minimise conveyor wear. This varies depending on the amount of raw material transported. VSDs provide the precise speed and torque control to meet the braking demand. With regenerative VSDs, the braking energy can be fed back into the plant’s electrical network, thereby not only saving, but also generating energy. The uninterrupted operation of mine hoists is most important to safety and production. They provide access to the mine, allow the movement of miners and material, and serve as evacuation routes in case of emergency. VSDs enable soft starting and stopping of the equipment, as well as smooth and fast acceleration and deceleration. This allows for greater equipment control and prevents motors from heating. Fig. 3: Drives in action. Monitoring mine hoist equipment allows operators and maintenance personnel to schedule preventive maintenance tasks, so increasing the safety and reliability of the operations. ABB’s medium-voltage VSDs can be equipped with an intelligent remote monitoring and diagnostics system which delivers important information on equipment status and possible maintenance needed. ABB’s mine hoist VSDs can be designed with redundancy to allow for continued hoist operation at half-speed and under full-load if required by the process. This function ensures the safety of the hoist system, continued production and reduced maintenance time and cost. VSDs improve productivity and increase energy savings. Examples include an iron ore mine in Mexico which replaced the damper fan control of its “pellet cooling fan”, rated at 1250 kW, with a medium-voltage drive with significant savings. A VSD was fitted to a conveyor belt at the Los Colorados Mine in Chile. With the existing gearbox, the nominal motor speed was not high enough to reach the nominal throughput of the conveyor belt. The drive was installed to soft start the motor, allowing a smooth ramp-up. The existing gearbox did not need to be replaced and the speed could be increased by almost 25%. Bauxite from Worsley Alumina’s mine in Western Australia is transported by conveyor to a refinery 51 km away. This conveyor was originally driven by DC drives, which did not provide the required levels of reliability, leading to high maintenance. The fundamental problem was that DC technology was underpowered for the requirements of the expansion designed to increase the refinery’s capacity. The replacement resulted in an increase in conveying capacity, improved conveyor control, improved start/stop performance, reduced maintenance and increased availability.